After our recent trip to Western Canada, we wanted to share a list of some of the top things to do in Edmonton Alberta. As Alberta’s capital city, there are loads of things to do in the city from skiing and biking to visiting farmers’ markets and perusing art galleries. During our time in the capital, we did a Segway tour in Canada’s largest urban park, went to a hockey game, visited an art museum, searched for street art, rode a roller coaster in North America’s largest shopping mall, appreciated plants in a glass pyramid, and ate our way around the city’s growing food scene. 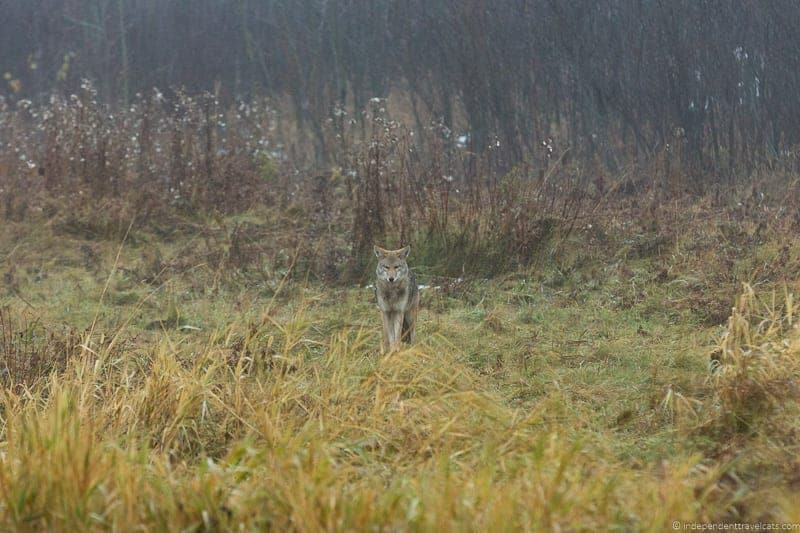 We also made a day trip to nearby Elk Island National Park for some great wildlife spotting! We’ll share our tips for visiting the city and our list of the top things to do in Edmonton Alberta based on our recent experience. Best Times of Year to Visit Edmonton? Finding Additional Information on things to do in Edmonton? Edmonton is the capital of Alberta, one of the provinces in the western part of Canada. The city is located in south central Alberta and is the province’s second largest city. Both Jasper National Park and Banff National Park are about a four hour drive away. Calgary, Alberta’s largest city, is about a three hour drive south. Most visitors outside of Canada will likely arrive by air, and the Edmonton International Airport (EIA) is the main airport serving the city. There is also an airport in Calgary. Those in Canada (or in parts of the United States) may also want to drive or come by train as Edmonton is also well connected by rail. Edmonton is a fairly easy city to get around, with an extensive public transit network that includes buses and light rail trains. You can also take taxis or use Uber. We had a rental car during our stay, which made getting around a lot easier. However, if you have a car be aware that parking in the city center is generally not free, and most city center hotels charge in the region of $15 to $20 CAD per night for parking. There are Park & Ride locations throughout the city if you arrive by car but want to use the buses or light rail to get around the city. 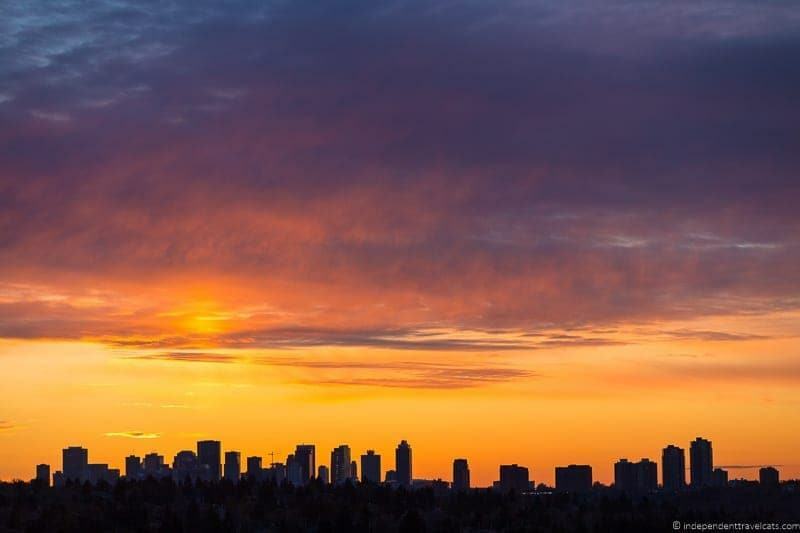 Edmonton has a seasonal varied climate with cold winters (average temperatures often below freezing) and warm summers. Winter lasts from about November to March with short autumn and spring like seasons in between. The wettest month tends to be July. 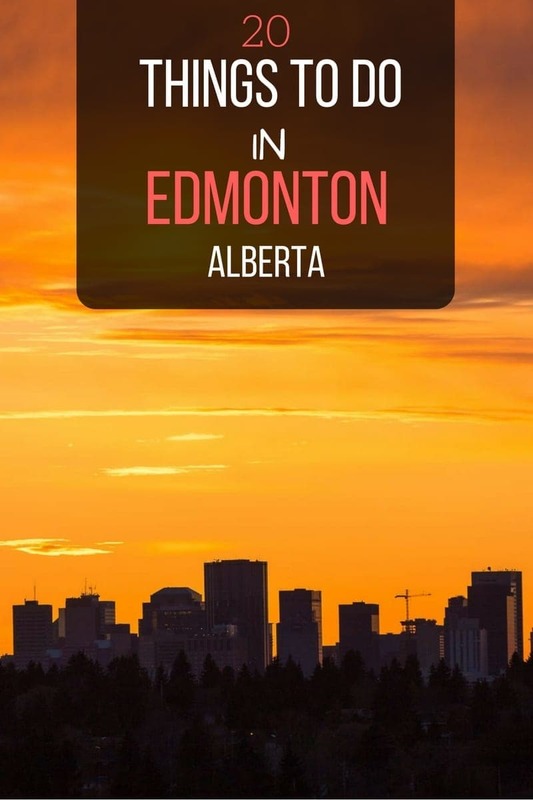 There is no best time to visit Edmonton as it depends on your interests but the weather does have some effect on the available things to do in Edmonton. In the summer, you’ll find more attractions open, warmer weather, and the majority of the city’s festivals take place between June and August. However, in the winter you have the opportunity for skiing and other winter sports, winter festivals such as the Silver Skate Festival, holiday celebrations, outdoor ice rinks, lower prices, and fewer visitors. Also if you are planning to head north to chase the aurora borealis, northern Alberta and Jasper National Park are prime spots for seeing the Northern Lights with the best chances to catch them from September through early May. 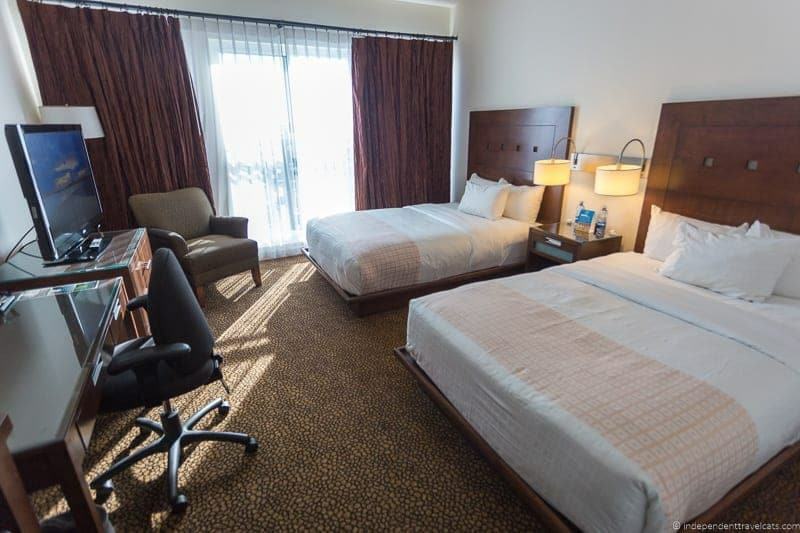 There are a lot of lodging options in Edmonton from hostels and budget motels to mid-range and luxury hotels, so you should be able to something that suits your budget and style. 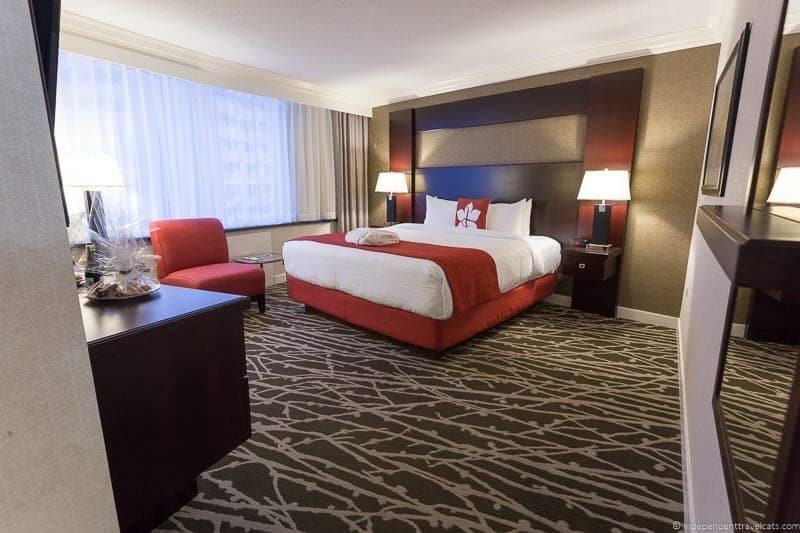 You can search and compare lodging in Edmonton here. We recommend trying to find a central spot in Edmonton to have easy access to the city’s main attractions. During our time in Edmonton, we split our time between the downtown area and Old Strathcona, staying at two different hotels. This ended up being a good idea as it allowed us to explore these two different areas of the city more easily. Our first hotel was the Chateau Lacombe located in the downtown area. We had a nice suite with a good view of the city skyline and it was a short walk from many of the city’s highlights, including Rogers Place and the River Valley Park. 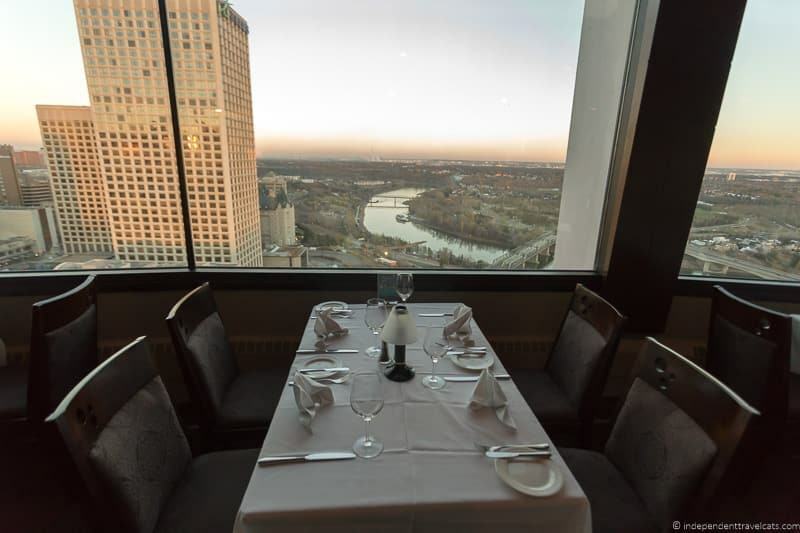 Chateau Lacombe is also home to La Ronde, Edmonton’s only revolving restaurant which offers panoramic views from the 24th floor. Our second hotel, the Metterra Hotel is located on Whyte Avenue in the center of Old Strathcona. We had a standard room but the location was perfect for us to explore the area on foot and it was close to a number of shops, restaurants, and theaters. Our stay included complimentary breakfast, free valet parking, and a daily complimentary wine and cheese tasting hour! These were amazing extras and we highly recommend making time to attend the wine and cheese hour each evening before dinner. You can also check Airbnb (claim free credit by just signing up!) and similar alternatives to Airbnb if you are wanting to stay in a room or apartment in Edmonton. You can also find serviced apartments, camping, caravan parks, and other options in the city. The city of Edmonton goes by a lot of possible nicknames, such as The Big E, Oil Capital of Canada (official slogan/nickname), Canada’s Festival City, The Chuck, The City of Champions, E-Town, Gateway to the North, Canada’s magpie capital, and River City. You’ll also see a lot of local people just writing YEG or yeg to refer to Edmonton, especially on social media, which is in reference to the city’s airport code. Similarly Calgary (Alberta’s largest city) regularly goes by yyc, its airport code. If you are looking for additional information on planning your trip to Edmonton, check out the Explore Edmonton tourism site which is full of information, tips, lodging information, itineraries, and upcoming event information. If your travels are taking you to other locations around the province, check out the Travel Alberta tourism site for trip planning information. Laurence and I have not yet traveled very much in Canada, in fact, our trip to Alberta was Laurence’s first time in Canada! I had been a couple of times before, but only to the Niagara Falls area in Ontario. When asked to come to Alberta to explore the capital city of Alberta and experience the Dark Sky Festival in Jasper National Park, we both had to consult a map to see where Edmonton and Jasper were located. But come to Canada we did and we are so glad that we got to have a taste of Western Canada. We are both looking forward to returning to explore more of Alberta as a week was definitely not enough time. If you are interested in heading to Jasper National Park from Edmonton (a 4-5 hours drive or shuttle ride), you can read this post Laurence wrote about our time exploring Jasper and attending the Dark Sky Festival. Now onto our recommendations for things to do in Edmonton to help you put together your own Edmonton trip itinerary! Whether you have one day or a week, you should be able to find plenty of things to do in the city from this list. Edmonton is the capital of Alberta so the main buildings of government for the province can be found here. 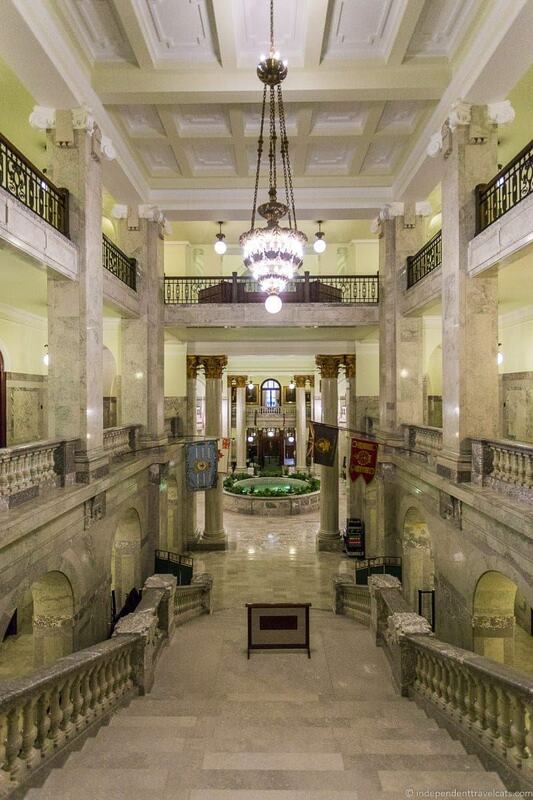 Visitors can take a guided tour of the Alberta Legislature Building, an impressive Beaux Arts style building built between 1907 and 1913. 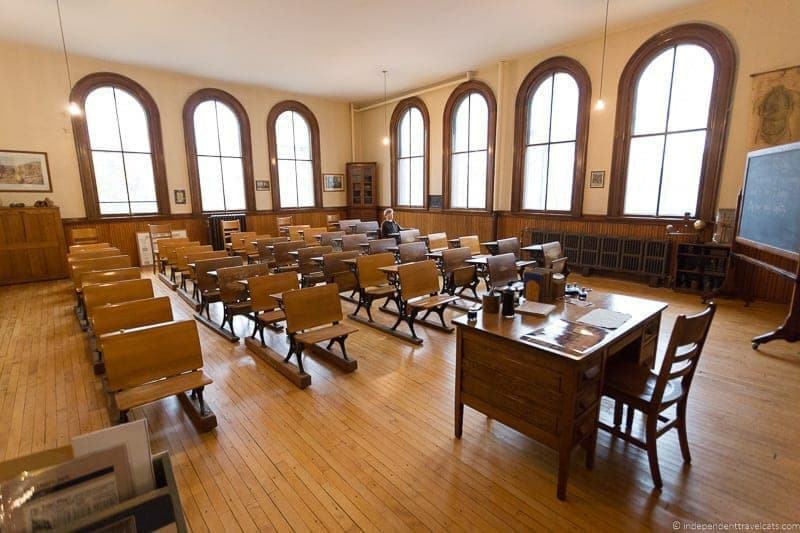 The guide will tell you the history of the building, show you the primarily architectural features and art of the building, describe a bit of the political process in Alberta, and tell you a bit about some of the most famous premiers (leaders of Alberta’s government). A curious feature inside the building is the palm trees growing around the inside of the dome of the legislature building; how they got there is unknown although they are believed to have come from California in the 1930’s. Tours are free and generally given every hour on the hour (just check the website for tour times and information). 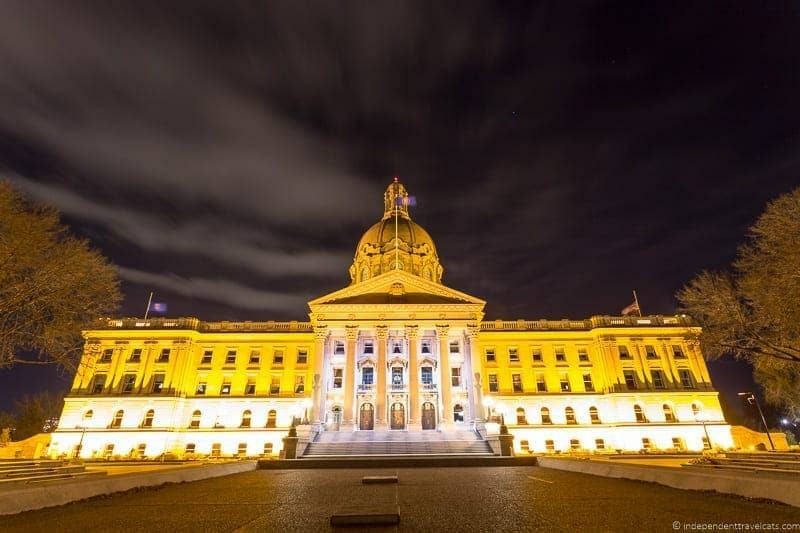 You can also pick up a brochure for a self-guided tour of the grounds of the Alberta Legislature Building, which feature 56 acres of manicured lawns and trees and contains a number of memorials, statues, fountains, and other points of interest. Before or after your tour, we’d recommend taking the time to visit the new Alberta Legislative Visitor Centre which is on the main floor of the Edmonton Federal Building just a 3 minute walk from the Legislature Building. Here you’ll find the Pehonan Theatre where you can watch a free 4-D show about Alberta’s parliamentary history and culture (recommended! ), the Agora Interpretive Center, and the Alberta Branded retail shop selling local products. For those interested in a good general museum that has a bit of everything from the history and culture of the area to natural history and science, I’d recommend the Royal Alberta Museum. 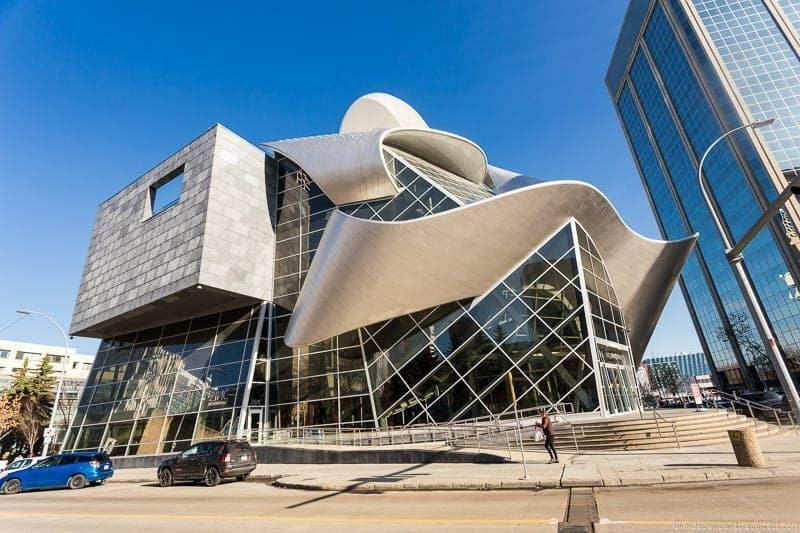 For art, I’d recommend the Art Gallery of Alberta which has a funky photogenic building and a collection of over 6,000 works from both Canadian and international artists. For everything science and for some great IMAX movies, head to the TELUS World of Science. There are also plenty of museums for those with a special interest such as the Alberta Railway Museum, Alberta Aviation Museum, Edmonton Public Schools Archives and Museum, and the Ukrainian Canadian Archives and Museum of Alberta. Even if you are someone who hates museums, you might still want to check out the outdoor Neon Sign Museum on 104th Street, which is simply an outdoor collection of old working neon signs from around the area with some informational panels. No matter your interests, you’ll likely find at least one museum of interest in Edmonton. 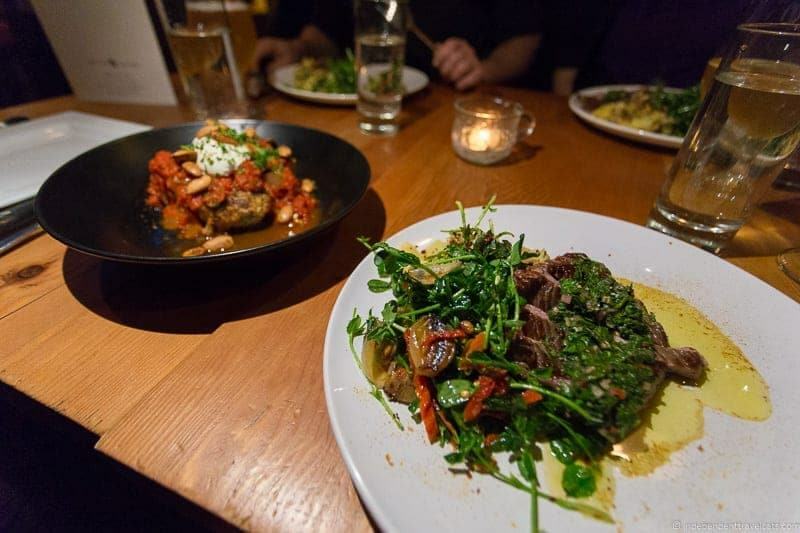 Edmonton offers a wide variety of places to eat and being a larger city, there are always new places popping up. Some places we tried and can recommend during our time in Edmonton include Next Act Pub (classic pub grub in Old Strathcona), MEAT (BBQ places with their own sauces in Old Strathcona), Tres Carnales (popular downtown Mexican taqueria), Mercer Tavern (pub known for its fried chicken across from Rogers Place), Woodwork (nicer dinner-only New Canadian restaurant in downtown known for its wood-fired dishes and cocktails), and MKT (pub food and large beer selection in a historical railway station in Old Strathcona). For coffee or tea, we had a nice coffee and tarts at the Duchess Bake Shop on 124th Street, a good cuppa at Canadian tea chain David’s Tea, and coffee and a muffin in the pleasant but out of the way Little Brick Cafe & General Store in north central Edmonton which also serves breakfast and lunch. You might also want to take a food or drink walking tour to sample some of the city’s edible delights. Here is a list of several tours, which include food walking tours, beer tours, and distillery tours. You can easily spend an afternoon or two exploring the vintage, thrift, and antique stores in Edmonton. Although they are dispersed throughout the city, we found a number of them within walking distance in Old Strathcona. 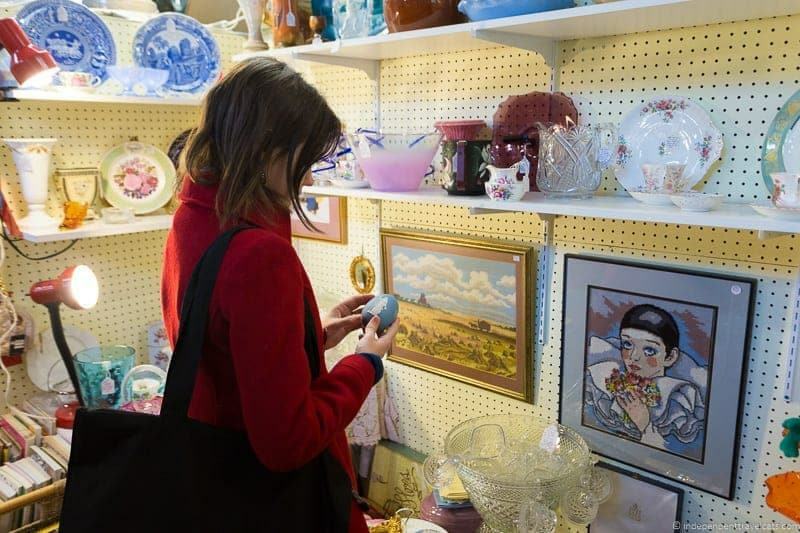 If you only have time for one place, I’d recommend heading to the Old Strathcona Antique Mall, the largest antique mall in Western Canada with over 130 vendors selling everything from Victorian era jewelry to industrial furniture to books and collectible glass. There is even a cozy nook upstairs offering free coffee and a small cafe offering refreshments and snacks downstairs. A few other places we visited during our time in Edmonton included the The Junque Cellar which specializes in a large variety of retro and vintage goods of all kinds, the Peacock Boutique which has a good selection of used clothing, toys, and household goods and is run by the Edmonton Emergency Relief Services Society volunteers, and Blackbyrd Cellar which specializes in vinyl (used and new), CDs, and music equipment. There are also a number of Value Village and Salvation Army stores in the city selling used clothing, accessories, furniture, and home goods. For alternative clothing (Gothic, hipster, hippie, etc.) head to Old Strathcona where there are a number of alternative and speciality clothing stores, especially along and just off Whyte Avenue. Edmonton has a number of art galleries, and we visited several during our trip. Use the Galleries West website to search for art galleries in Edmonton or elsewhere in Alberta or Western Canada. 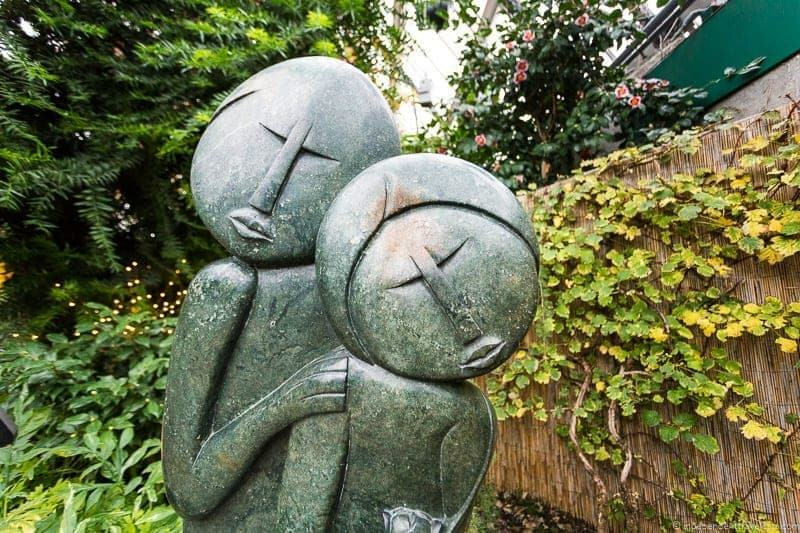 One street that has several art galleries within a short walking distance is 124th Street where we visited the Bear Claw Gallery, Peter Robertson Gallery, The Front Gallery, and West End Gallery. If you are looking for a larger collection but not interested in buying, we’d recommend a trip to the Art Gallery of Alberta. One big difference between Canada and the United States is the popularity of various sports. Hockey is the national winter sport of Canada and lacrosse is the summer national sport. 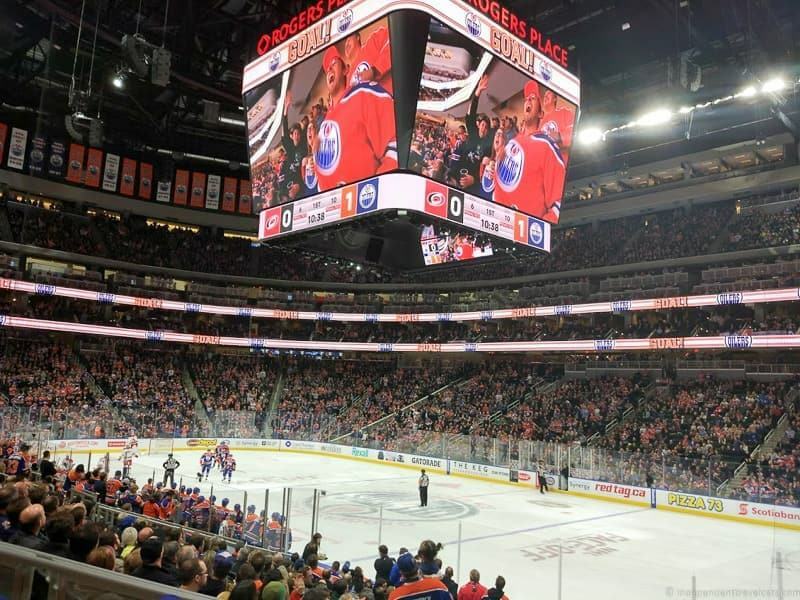 If you are in Edmonton during hockey season, we’d recommend heading to the newly built Rogers Place to watch the NHL team Edmonton Oilers or the minor league Edmonton Oil Kings. Wayne Gretzky, probably the most famous hockey player in history, played with the Edmonton Oilers from 1979-1988. On our first night in Edmonton we watched the Oilers defeat the Carolina Hurricanes at Rogers Place. The place was packed with excited fans, many seeing the stadium for the first time, and it is a great venue for sports or other events. Rogers Place will also be used for rodeos, concerts, and other sporting events so check out the event schedule for what might be happening during your visit. 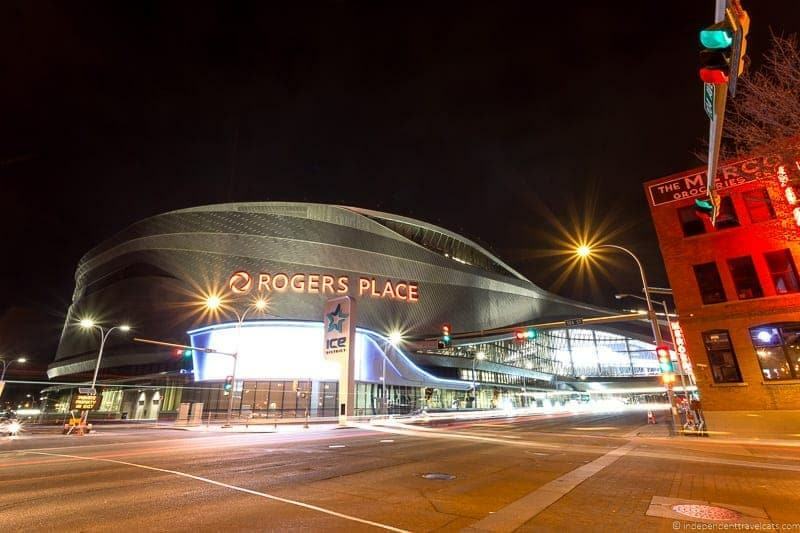 Rogers Place is one of a series of projects aimed to revitalize the newly named Ice District downtown area of Edmonton. look at that massive scoreboard! They say the neon lights are bright on Broadway…but in Edmonton you’ll want to head to 104th Street to see the brightest neon in town. The outdoor Neon Sign Museum is a collection of historical working signs that were collected from in and around Edmonton, repaired, and placed along a few buildings, mostly the Telus building, on 104th Street for display. The signs chosen are representative of the commercial signage that was once prevalent in Edmonton’s history and informational panels along the street provide a bit of background. Best to see after dark so you can get the full effect of the signs when they are turned on. 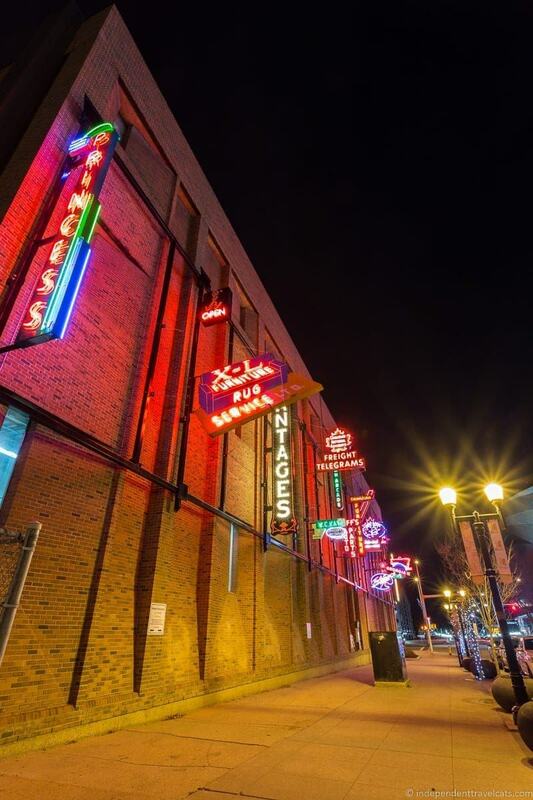 You’ll find the Neon Sign Museum just across the road from Rogers Place and Mercer Tavern. We didn’t intentionally seek out street art but we found several street murals and other public art displays in Edmonton, particularly in the area around Whyte Avenue in Old Strathcona. There are a few locations where artists are welcome to legally paint on the walls but these seem to be ever-changing. If you are wanting to find the latest best locations for street art, we’d recommend popping in and asking the staff at The Paint Spot for tips. Across the river from downtown Edmonton are four large glass pyramids which look a bit out of place amongst the North Saskatchewan river valley. These pyramids are home to the Muttart Conservatory, a botanical garden which hosts four different biomes (one in each of the four pyramids), featuring plant species from around the world. 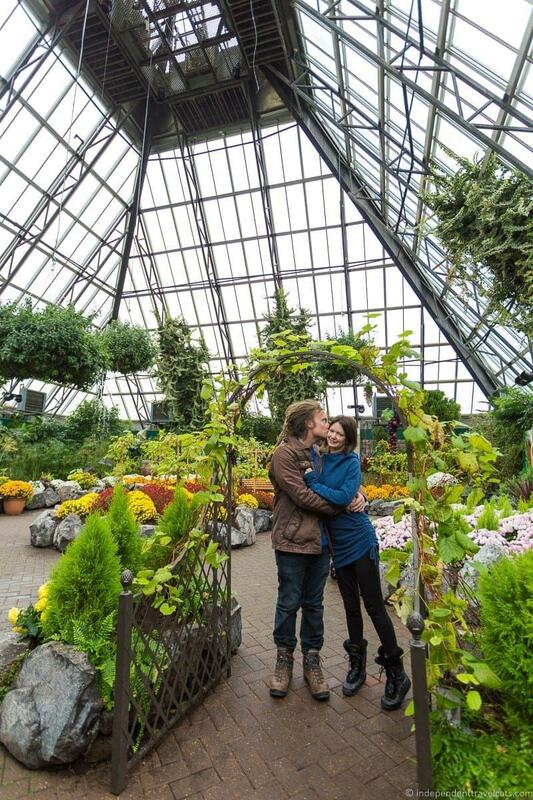 It was already cold when we were in Edmonton, so we were excited to see some flowers and exotic plant species. Three of the biomes house permanent displays, featuring a temperate zone, an arid zone and a tropical zone. Be prepared for a bit of humidity and heat! The fourth pyramid features a rotating display and it was a Tuscany themed exhibit during our visit. After checking out the four pyramids, we enjoyed soup and a tasty sandwich at the good on-site cafe. If you are wanting to get off land, you might consider a boat tour while in Edmonton. 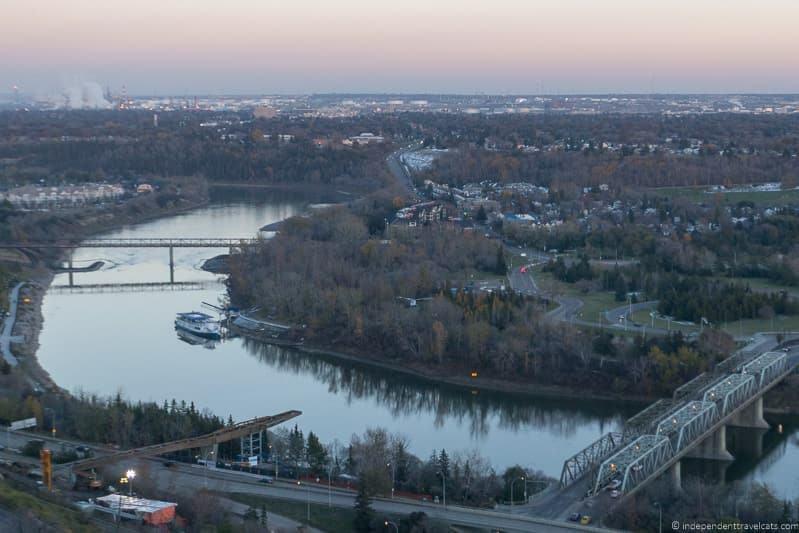 Whether you are looking to go fishing in one of Edmonton’s rivers or lakes, or just want to sightsee along the mighty North Saskatchewan river, there are several companies offering boat tours in Edmonton. One of the local fishing companies is Get Hooked Fishing Adventures. The Edmonton Queen riverboat is an iconic Edmonton boat that offers sightseeing tours and entertainment on the North Saskatchewan River. During our visit the riverboat had just been sold and was out of commission, but it has been renovated and is back in action. If you have a car during your time in Edmonton and enjoy wildlife, then we very much recommend taking a day trip out to Elk Island National Park. It is about an hour’s drive from downtown Edmonton. Elk Island National Park is Canada’s largest fully enclosed national park and is an important refuge for a number of animals, including bison, elk, moose, coyotes, deer, wolves, beavers, and over 250 bird species. In addition to wildlife spotting, it is also a popular place for picnicking, hiking, canoeing, and camping. In winter, there are also opportunities for snowshoeing and cross-country skiing. Unfortunately we visited on a rainy gray day, but we still saw a herd of bison, a coyote, and grouse as we drove along the park’s roads and stopped at a couple of the lakes. If you don’t have the time (or car) for a day trip to Elk Island, you can still do some wildlife spotting in the city’s many River Valley parks or head to the Edmonton Valley Zoo for some more exotic animal spotting. 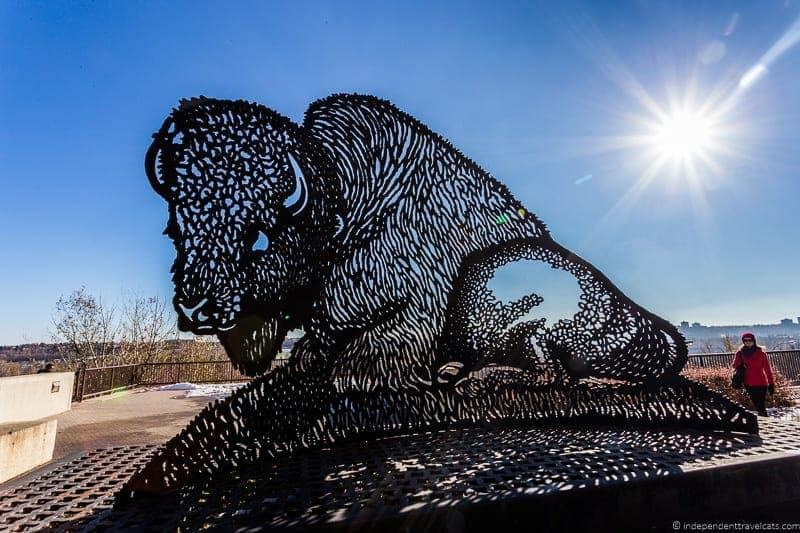 For those who are really interested in learning about the bison, I would recommend booking one of the Bison Backstage Tours if they are available during your visit. These are 45-60 minute tours with a park ranger that allow you learn more about the bison conservation efforts taking place at the park. I love animals of just about any type but I am always amazed by seeing bison in the wild, such magnificent animals. 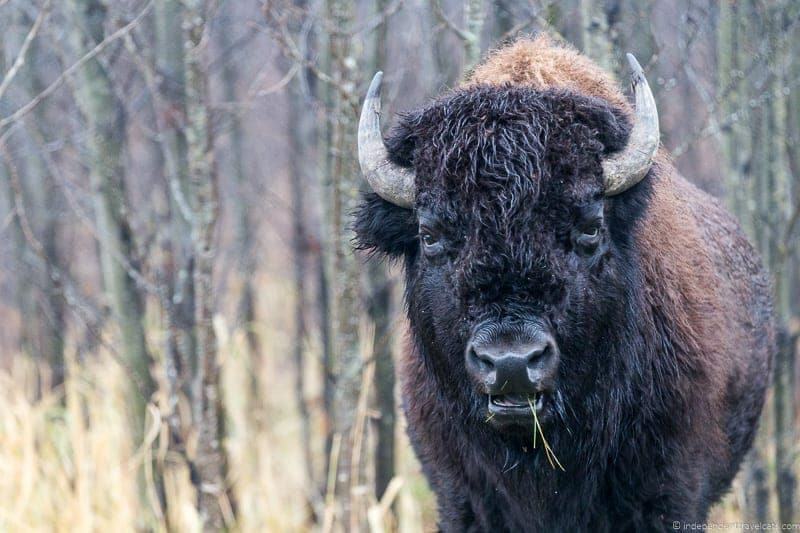 Elk Island National Park has both wood bison and plains bison and manages the recovery of both of these species. It is sad to think about the number of bison that once roamed the plains of North America before the mass hunting and killing of the animals to almost extinction. 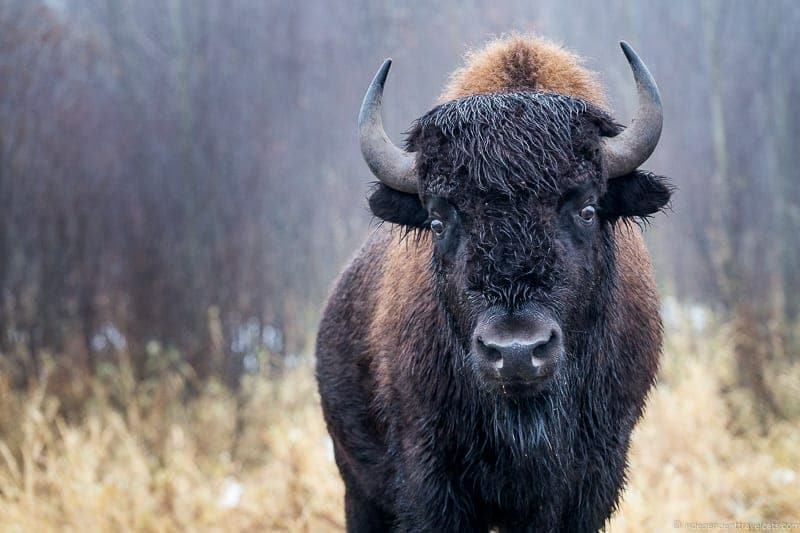 Currently there are more bison at Elk Island National Park than existed in all of North America in 1890! A shopping mall may not sound of high interest, but the West Edmonton Mall is probably the largest attraction in Edmonton. It is very very big! It is currently the largest shopping mall in North America and until 2004 was the largest mall in the world! In addition to the obvious pursuits of shopping (there are over 800 stores to choose from) and eating, there is much else to do in this giant mall complex. 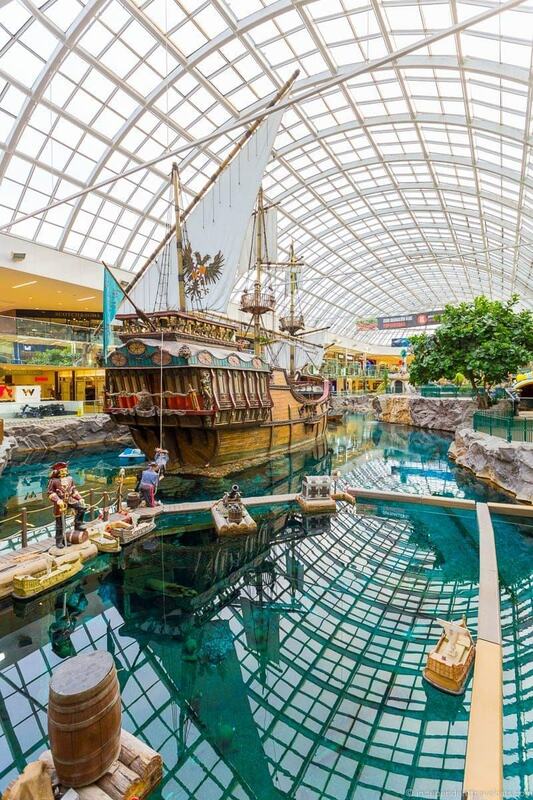 Our day at the West Edmonton Mall started off with admiring the impressive full-size replica of Christopher Columbus’s ship Santa Maria, then onto a game of blacklight mini-golf (I won! ), then a bit of winter gloves shopping (found some at Hudson’s Bay), a break for a quick lunch at one of the food courts (Greek fast food), then we visited Galaxyland which is the world’s second largest indoor amusement park (the Mindbender roller coaster is scary! ), and finally our day ended with us getting wet at the indoor waterpark (lots of fun slides and pools). In addition to what we did, there is also an ice skating rink, bowling alley, aquarium, bingo parlor, mirror maze, comedy club, cinema (includes IMAX), piano bar, and dinner theater! You can easily spend most of a day here (as we did) but some people spend a full weekend here. If you plan to visit multiple parks and attractions, I would check out the current promotions and passes available at WEM to see if they would save money over buying individual tickets. 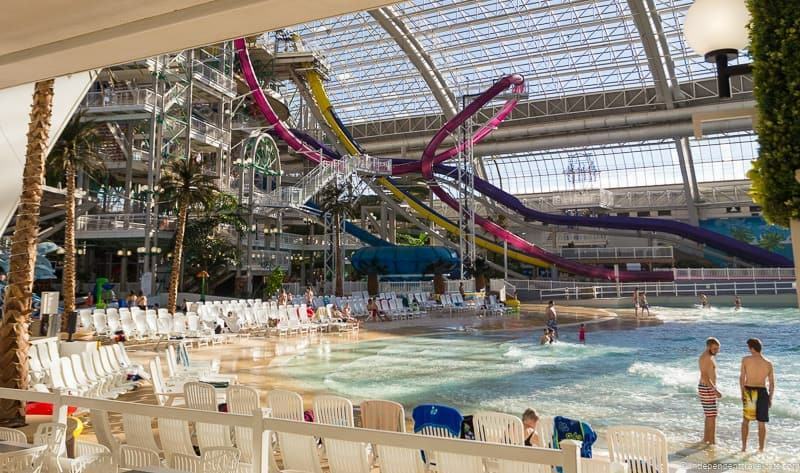 If you want to stay overnight there is the popular Fantasyland Hotel Resort (featuring themed rooms) as well as the more simple West Edmonton Mall Inn located within the mall complex. No many cities offer skiing within the city limits but you can ski, snowboard, or just do a bit of snowtubing without leaving Edmonton in the winter months. Ski season had not yet begun when we visited but Edmonton had already had its first snow so it was expected to begin soon. If you are visiting in winter, you can check out rates and latest snow conditions at Snow Valley and Sunridge Ski Area. Old Strathcona is an area of Edmonton that was designated a Provincial Heritage Area due to the number of historical buildings found here, many over 100 years old. Strathcona was once an independent city that sprung up and prospered around its railway station. 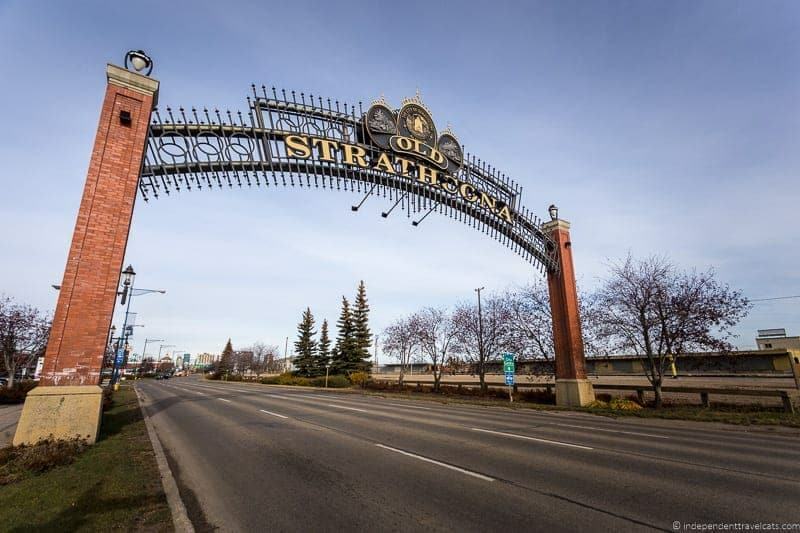 In 1912, Strathcona merged with the much larger city of Edmonton and the central district of what was once Strathcona is now the historic district of Old Strathcona. The main street here is Whyte Avenue which runs from 99th to 109th Street. 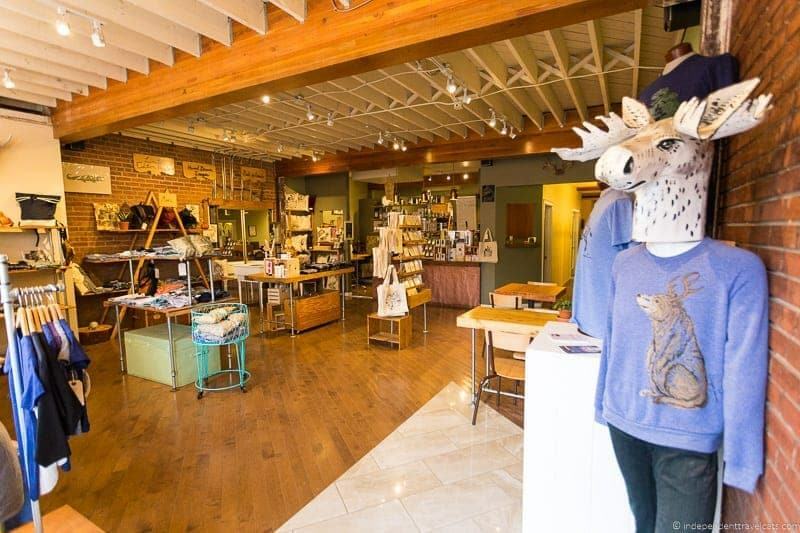 The area today has been revitalized and is known for its alternative clothing stores, independent boutiques, independently owned restaurants, art house theaters, and historical buildings. Every August, Old Strathcona is the central hub for the Edmonton International Fringe Festival, the largest and oldest Fringe Theatre event in North America. We spent quite a bit of our time in Edmonton in this area. For instance we bought used books at Wee Book Inn, browsed vinyl records at BlackByrd Music, ate at the Next Act Pub, admired the street art, went antiquing at Old Strathcona Antique Mall, and slept at the Metterra Hotel. One great way to get to know a city is to just pick a popular street and explore. We got recommendations from locals for areas to explore and headed off to walk from one end to the other, stopping at places we found interesting along the way. Three streets you might consider in Edmonton would be Whyte Avenue (see Old Strathcona section), 104th Street, and 124th Street. A number of Edmonton’s oldest buildings can be found on 104th Street, often referred to just as 4th Street or the 4th Street Promenade. 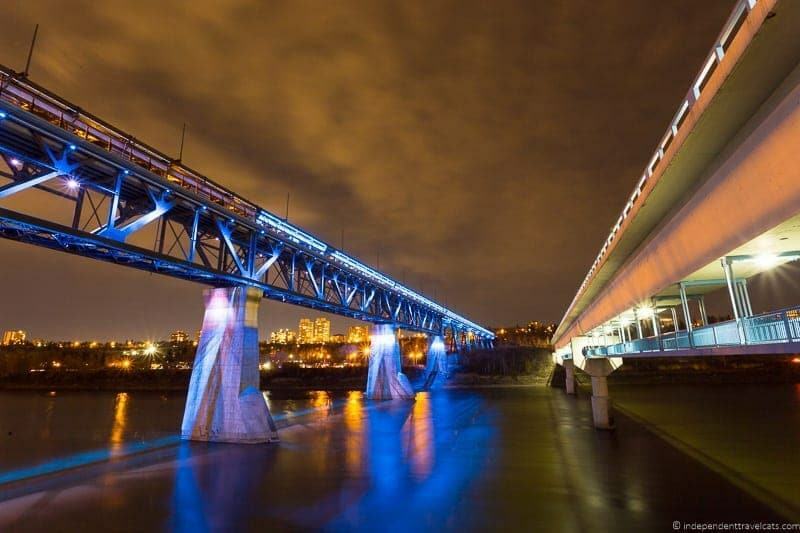 It runs from the former railroad tracks to the North Saskatchewan River, where the original Fort Edmonton and Fort Augustus shared a riverbank in 1802. You’ll find a lot of former brick warehouses in this area. Today it is both a business district and residential neighborhood, and is one of the downtown areas undergoing revitalization with a number of new restaurants and shops popping up here. It is also a gateway to the new Rogers Place arena and newly planned Ice District. 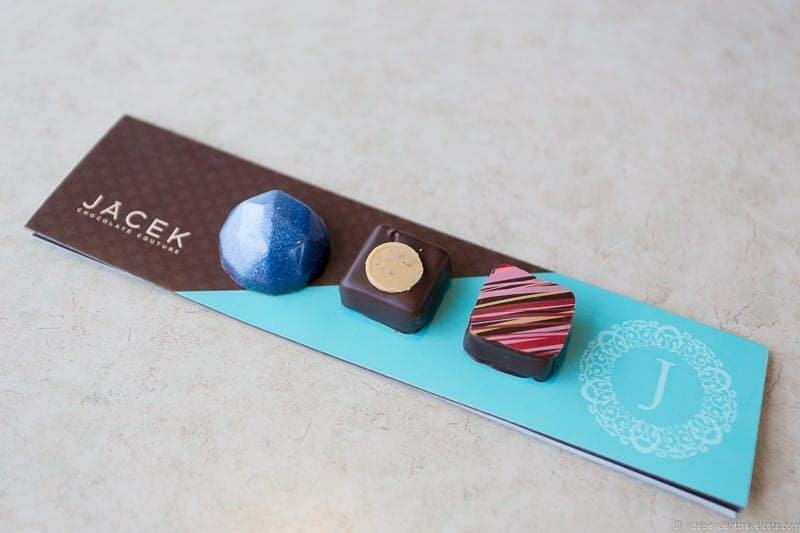 We spent most of a morning visiting shops, having lunch, reading some of the many historical plaques placed along the street about the history of the buildings in the area, seeing the Neon Sign Museum, and buying some sweet artisanal chocolates from Jacek Chocolate Couture. For those who like history and architecture, you can put together your own self-guided downtown walk using this historical walking tour guide which gives you plenty of info about a number of historical buildings in Edmonton and organizes them by area, including one focused on 104th Street. 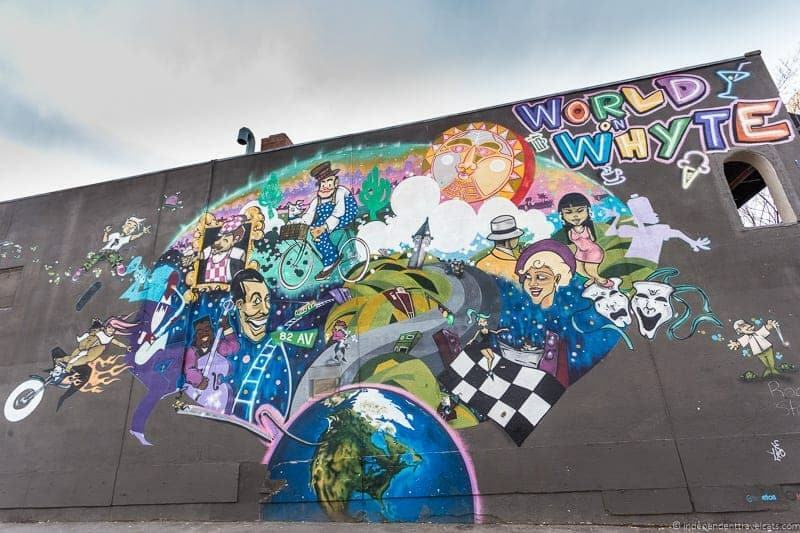 If you want to explore Edmonton’s art scene, 124th Street is a great street to do it. 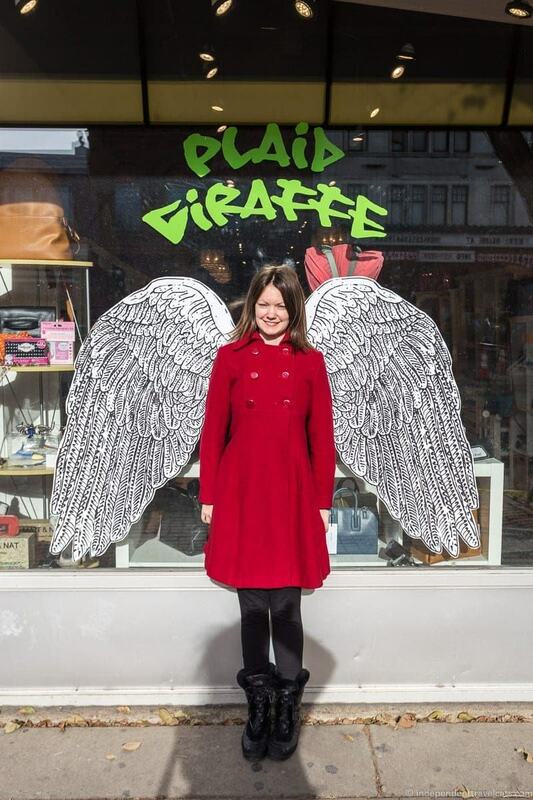 The street is home to a number of excellent art galleries along with a mix of eateries, boutiques, offices, and funky stores like the Barking Buffalo which is both an independent clothing store and coffee shop. We spent most of our time having coffee and pastries at the Duchess Bake Shop and perusing art galleries. Two of our favorite galleries were the Bear Claw Gallery which has a wide range of amazing First Nations art and the Peter Robertson Gallery. 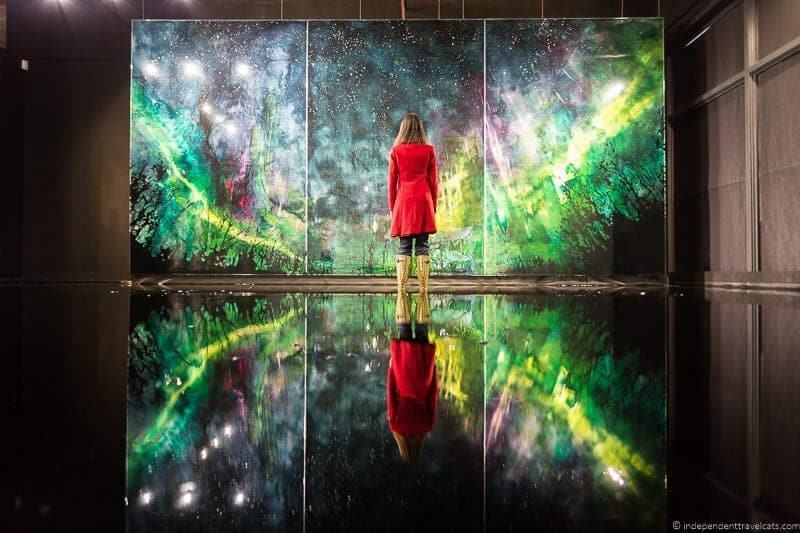 During our visit to the Peter Robertson Gallery, one of the gallery rooms had been flooded with water for an incredible art installation featuring Canadian artist Steve Driscoll. If you love history, you’ll want to be sure to save some time to visit the family-friendly Fort Edmonton Park, a living history museum that brings to life Edmonton’s history from about 1800 to 1930. The park’s name comes from the former Fort Edmonton, which was a trading post set up by the Hudson’s Bay Company to trade in beaver pelts. The fort once sat near where the Alberta Legislature Building sits today and the remains of the old fort were torn down in 1915. The park is set up around different historical periods, such as the fur trading era and the municipal era, and allows visitors a chance to learn and explore what the city would have been like in that time period through costumed interpreters, demonstrations, replica buildings, attractions, information panels, and games. The park includes eateries, period transportation rides (e.g., streetcars and wagon rides), a penny arcade, live theater events, and a miniature golf course. The park is only currently open to the public May to September; expansions are in the works to add more exhibits and attraction to this popular Edmonton attraction. This would be on the top of my list of things to in Edmonton on a return visit. There are a number of farmers’ markets in Edmonton where you can find fresh produce, buy freshly baked bread, and check out local speciality products. 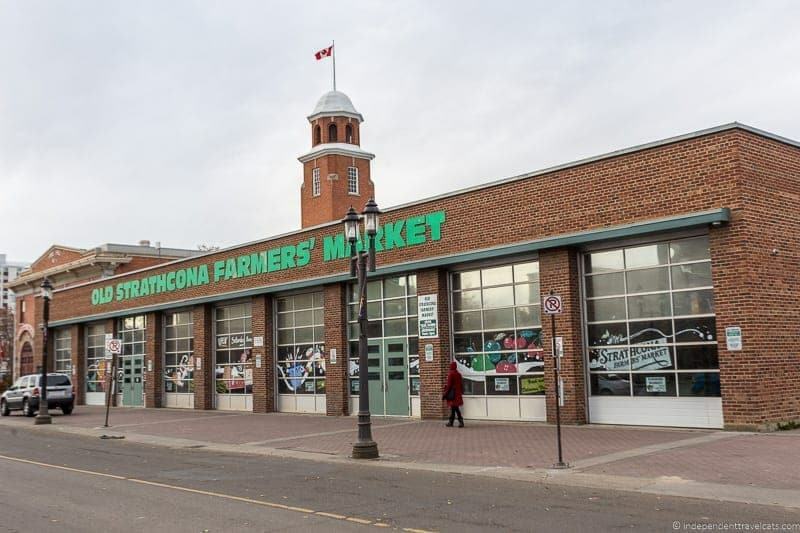 Two of the most popular are the City Market Downton and the Old Strathcona Market, which are both open on Saturdays. However, there are many other farmer’s markets in and around Edmonton and you can find a full list here. Many are open year-round but some are only seasonal. Edmonton is a great place to spend some time walking, biking, Segwaying, relaxing, playing, picnicking, and exploring in the city parks. Edmonton has the largest expanse of urban parkland in North America and the River Valley is the largest urban park in Canada. There are over 800 park areas, and over 400 official parks in Edmonton! I am not sure what actually constitutes a park, but you’ll find them in all shapes, sizes, and levels of facilities in the city. To find a park in your area of Edmonton, check out this exhaustive list of city parks. 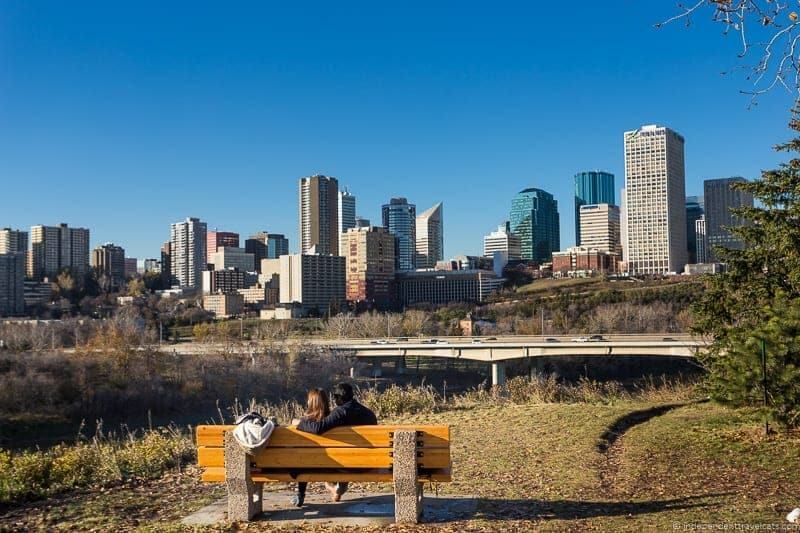 We can particularly recommend exploring the parks in the River Valley with interesting urban natural spaces like Whitemud Ravine Park & Nature Reserve. The River Valley Trail in Edmonton is part of The Great Trail of Canada, which will be the longest recreational trail in the world once completed, stretching from the Pacific to Atlantic Ocean. By the way, if you happen to encounter an unusually high number of black-and-white birds, these are magpies and there are a lot of them in Edmonton. Edmonton is known as the Canada’s magpie capital and the locals have a love-hate relationship with the bird. If you are looking for things to do in Edmonton in the evening, you might just want to head outside and look up. Edmonton is a great place for a sunset, and the best spots are probably along the river where you have a clear view of the river valley. Find a bench or bring along a blanket so you can settle into a nice spot along the river bank to watch the sunset. We chose to head to Ada Boulevard for a nice view, but you can ask around for other locally recommended locations throughout the city which are also popular date spots. 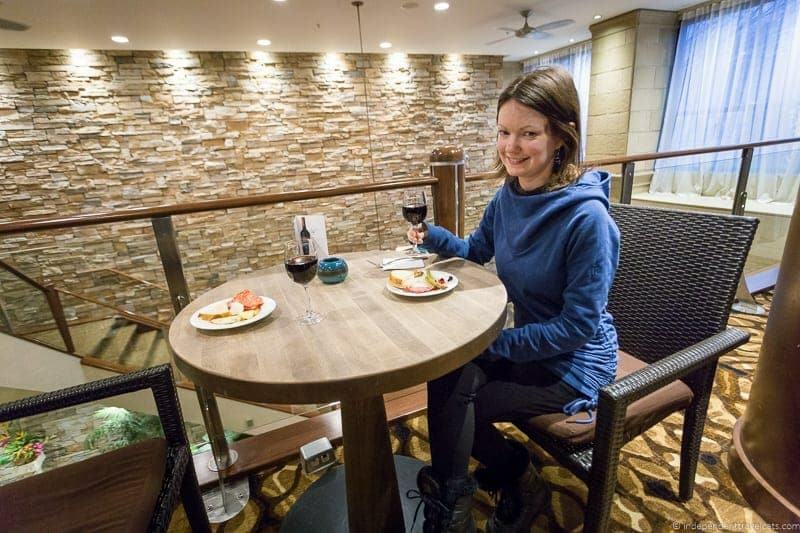 If you are looking for another idea for great views of the city, you might also consider booking a meal at La Ronde, a rotating restaurant offering panoramic views of the city located on the 24th floor of the Chateau Lacombe Hotel. If you are looking for something active to do but not too strenuous, consider a Segway tour or renting a bicycle to explore the area. The River Valley Adventure Co offers Segway tours, bike rentals, and snowshoe rental. 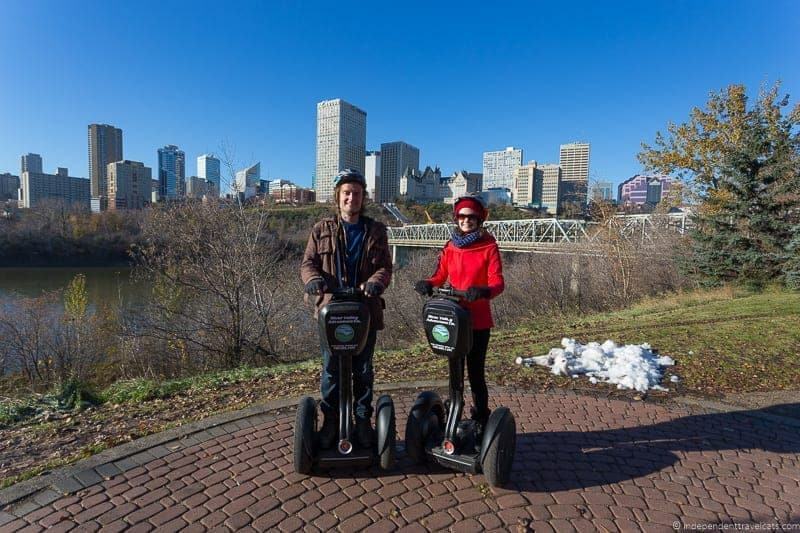 We decided to do a Segway tour through the beautiful river valley of Edmonton as a way to orient ourselves to the city. We specifically did this winter Segway tour during our visit. Laurence and I had both done a Segway tour before but not for a couple of years, so the safety video and training session got us back up to speed for the tour. It was a fun tour with some great scenery and a bit of local history about the river valley area of Edmonton. Our guide was very friendly and we felt quite safe throughout the tour even when navigating hills and crossing a couple of roads. The only downside is that the tour felt a little short, so we’d definitely recommend the 90 minute tour rather than the shorter 60 minute one. But the good news is that once you’ve done the training on one of their tours, you can book additional tours with River Valley Adventure Co that don’t include the training portion, meaning you can explore much further on a second visit. We didn’t have time for a second visit, but we did learn that River Valley also operate tours of Edmonton’s downtown area, which sounded like fun. Have you been to Edmonton Alberta? If so, what are your favorite things to do in Edmonton and what tips do you have for visitors wanting to make the most of their time in the city? 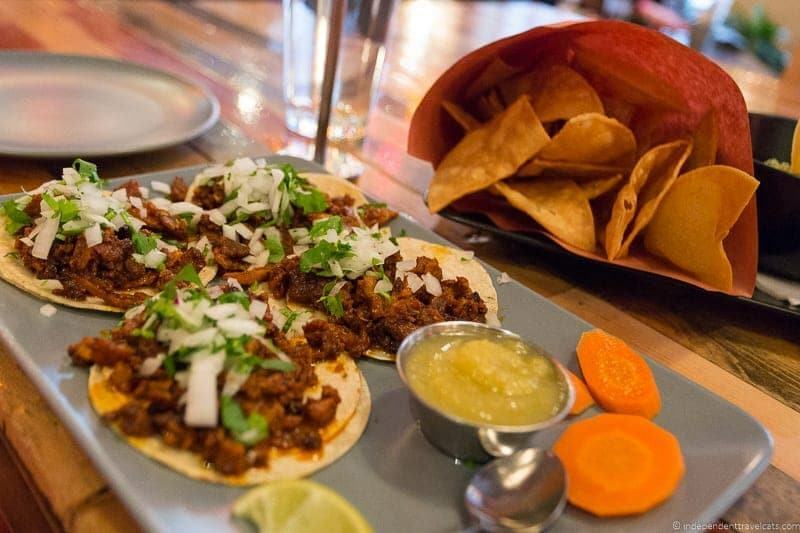 If not, which of these things would make it on your Edmonton itinerary? As always, feel free to ask us any questions about our trip to Edmonton below and we’ll do our best to answer them all! I think Edmonton is one of the great places in Alberta, tourist should get to see this wonderful spot when they visit the country of Canada. I really love travel, I wish I could have the time and money to go around the world but thanks so much for your guides to help one do so. I love reading them. When I visit other country, I often look for and buy some souvenirs, so I feel interested in the Vintage and Antique shops you recommend in this post, I’ll go there when I come to Edmonton Alberta. That’s a comprehensive list of things to do in Edmonton! I love the wildlife photos you took at Elk Island national park and would certainly love to go there, if I visit Edmonton. Also, Fort Edmonton Park, the living history museum, is a place I’d love to visit. I’ve never been to Alberta, but your post made me want to travel! I love cities where we thought would be “boring” but actually housed great hidden stuffs! Can’t wait to give this place a try! Except for Elk Island, I think we managed to miss just about everything on your list when we went to Edmonton last year. We did find a great cycle path though along the river. Thanks for all the ideas on things to do in Edmonton. I like the combination of large indoor spaces and the outdoors. As always your posts is full of great information and beautiful pictures! Just the building that holds the art gallery is impressive, so I would definitely love to visit. The food looks great and so does the street art. I had no idea there was so much to see in Edmonton. Thanks for sharing on #WeeklyPostcard. What a great city guide! 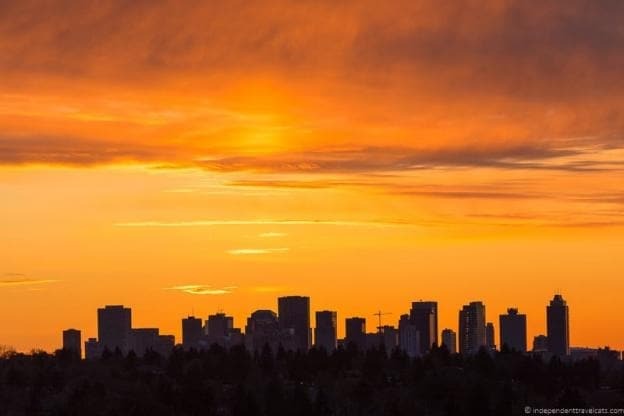 Edmonton is definitely not a city most people want to visit, but it should be! My sister lives in Edmonton, so we visited for a few days to visit her and attend a friends’ wedding. Our favourite place to visit was the Zoo, a fantastic place and our daughter loved it! If time allowed, we would have liked to get to Elk Island. You took some gorgeous photos there!